Forgive the delay in my writing. Turns out teaching and blogging are both more work than I bargained for. I’ve been very busy the last two weeks. This installment I don’t have a treatise on some aspect of Ecuadorian culture; instead I present a few simple highlights from the last two weeks in my life. Soon, I hope to find time to share with you some amusing and curious quirks about life here and more about teaching. Please, do hold your breath, I need some pressure on me to get it written. Last weekend, my host family went to the beach and left me behind in their house alone. That’s really not as bad as it sounds. They had to leave Friday morning and I had classes Friday, and it was nice to have the house to myself. There’s my independent American-ness coming out again in my delight at spending a weekend alone in an empty house. That Saturday my host brother, who now lives with his mom in another part of the city came to the house and we went grocery shopping and then made empanadas, Chilean style (ground beef, raisins, olives, onion, and red pepper, seasoned with cumin) . 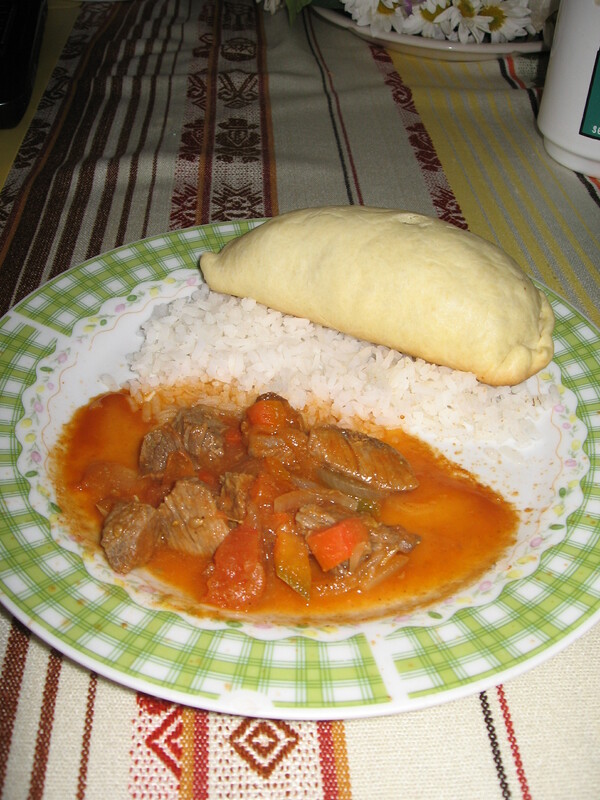 As usual with all the recipes from home that I try to cook in other countries, it came out a bit different, but still good. I was able to serve them to my family for dinner when they got home late Sunday night, and they were a huge hit. This last weekend, it was just my host sister and me in the house Friday and Saturday. Friday night, I went out for pizza with several of the students in my evening class. We had a great time, and it was fun to socialize, speaking Spanglish. These are the times my Spanish improves the most, because inevitably, I get myself into a conversation about something that is actually way beyond my ability and vocabulary. Case and point, I started telling one of my students about my Mom’s trip to India to visit a Rotary project building gully plugs (represa – dam) to replenish the aquifer (acuifero) which has been depleted due to climate change and deforestation (deforestación). Fortunately, my student has a master’s degree in Disaster Management and was able to help me through it. After all, I was telling him because I wanted to convince him that he should join a Rotary club. Earlier in the day, I had gone to a fancy bakery and bought two brownies, so my host sister and I shared dessert when I got home. Saturday we went to my host brother’s house, where we wasted most of the afternoon waiting and watching “Step Up 3” (terrible movie). 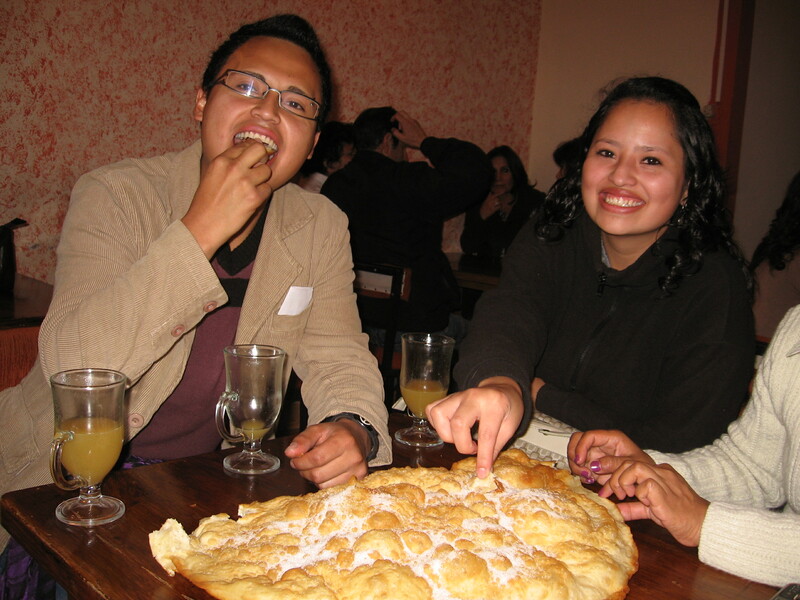 In the evening, we went to La Ronda, which is a pedestrian street in El Centro Historico (the old colonial part of Quito) where we stopped to have canelazo – a traditional Ecuadorian drink made from naranjilla, a little yellow fruit that I don’t like very much – and a giant empanada. The drink is a sweet mixture that you can order with or without alcohol. And here, when they talk about empanadas, they usually mean bread/dough filled with cheese and fried like that thing featured in the photo, but small. Sunday was my host brother’s birthday, so he came over to the house and we had a big lunch and cake for dessert. 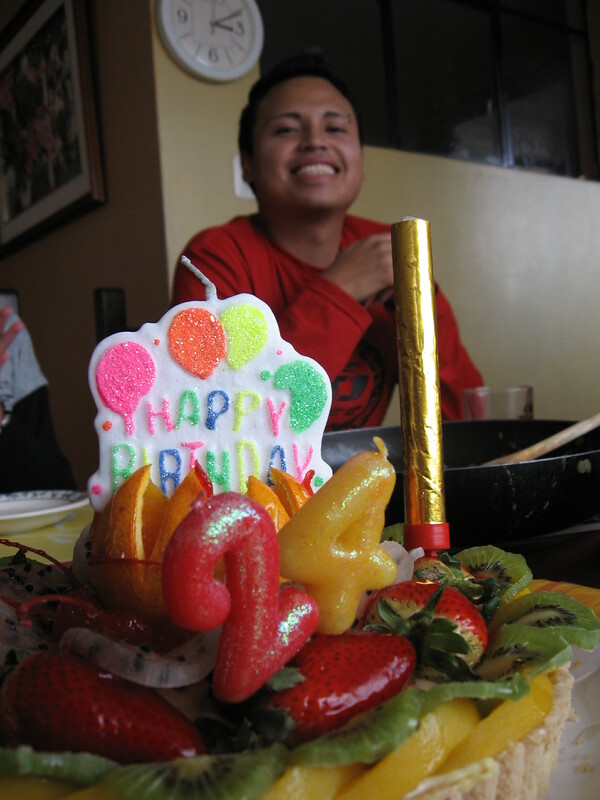 He turned 24 this year and it just so happened that I celebrated my 24th birthday back in May and had two candles in the shapes of the numbers 2 and 4 in my bag. One of my best friends from college had bought them when we celebrated my birthday and I had saved them for her birthday in July. (I plan to keep them until we turn 42, in… 2029.) How serendipitous it was that I kept those in my bag and carried them all the way here! The 2 and 4 seem quite large; saving the until 42 reminds me of the Valentines box that we have used for 26 years (it gets used annually). Maybe you will know 2 and 4 and 24 and 42 year olds frequently over the years.